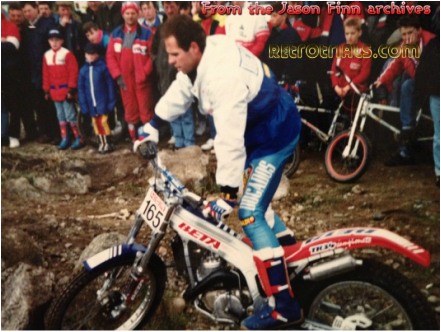 In 1989 Team Beta arrived at the great Scottish Six days Trial. Beta unveiled the new Beta prototype at this trial in front of the Fort William crowd. 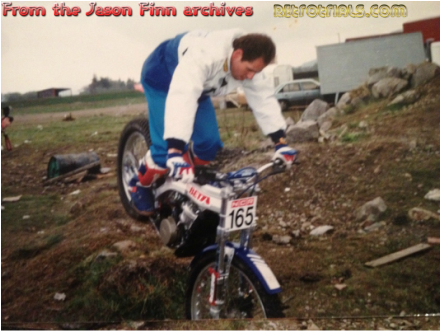 As it was lowered down on the lorry lift from the back of the team truck fans saw that this bike was very different. It was a completely brand new bike with a water cooled engine and entirely aluminium chassis. It looked brilliant and was a huge step forward in Trials Technology. It was to be ridden by Jordi Tarres the former 1987 World Champion. 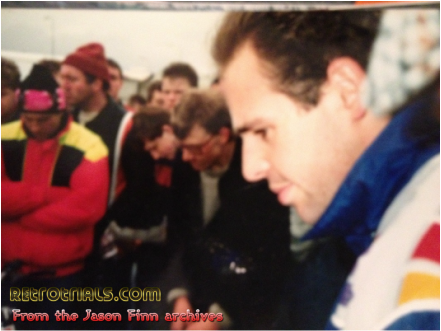 Unfortunately he had lost his crown to Thierry Michaud in 1988. Beta hoped to prove the new machines reliability in this the ultimate event. Unfortunately many readers will know what happened next. On day 2 of the Trial Jordi's machine suffered over heating problems after grass and mud clogged the radiator. 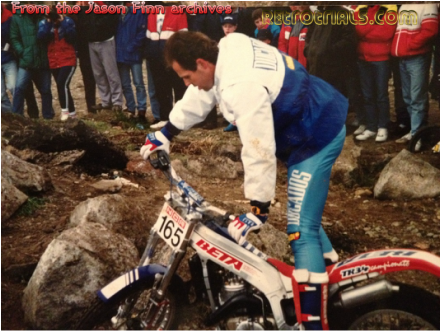 This over heating caused the retirement of Jordi Tarres and the new machine. 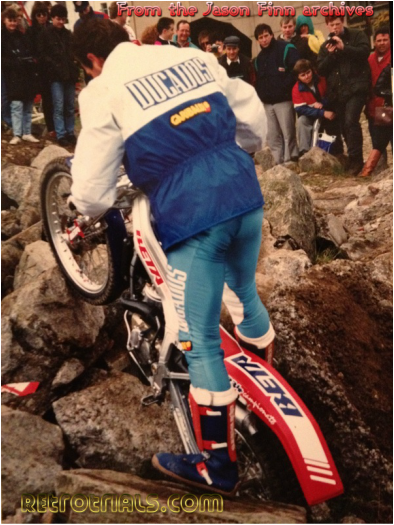 As far as i am aware this is the only photo in the World that shows the exact moment that Jordi's bike broke down. Jason Finn was watching his idol Jordi Tarres ride through the sections and saw the bike steaming. He then saw Jordi pull over and look down at the engine in disbelief. If you look closely you can see the dark patches on the engine , caused by water seeping from the engine and turning the dry mud a dark colour. You can see Jordi release the radiator cap. You can see the back of Fransesc Tarres' head ( Jordi's brother). You can see Team manager and Jordi's mentor Pedro Olle on the right looking down. An amazingly rare photo and one i never thought i would see.